 16 Armoured Army Reg., 2 Co. Original Issue - Shrink Wrapped - Mint in Box. 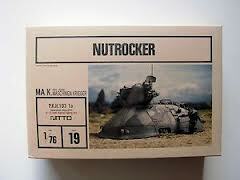 Nitto: Panzer Kamp Anzug Ausf G.
Original Issue - Mint in Box. 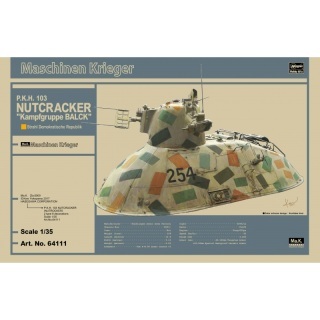 (Also listed as 24110|) Scale: 1:20 Released: 1984 Type: Full kit. 357 Armored Huntsman Reg., 3 company, 2 Platoon. Original Issue - Slight scuffing to box top - Contents Mint! 1:20th scale. IP/metal. Original Nitto S.F.3.D. 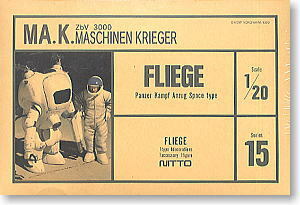 kit of the Panzer Kampf Anzug Space Type Fliege, the intermediate step between the Konrad and the Kauz, with four sets of markings and one figure. Series No.15. 1/20th Scale NITTO 1985 issue. 1/20th Series 18 - 1985. Contains 3 x choice of decals - Mini Lamp - Brass& Etching Parts. All Parts Sealed inside box - Virtually Mint. 1:76 IP. MAK Zbv 3000 Series no 19. 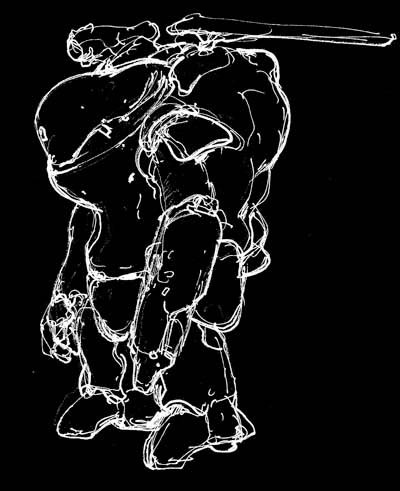 Long after the fires of WWIV burned out the planet, the heavy boots of war still stir the ashes. The power-armored legions of the Strahl Demokratische Republik stride across the land, enforcing order with servo-assisted fists. Against them are arrayed the mercenaries and defectors of the IMA, fighting for their homes and their freedom. The future knows only war and only the dead have seen the end of it. 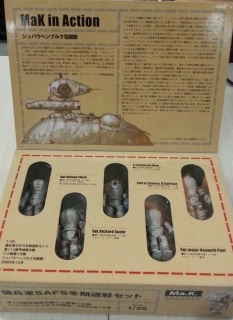 Kit features two power-armored warriors of the SDR with optional decals, different weapons, and fully detailed parts. Designed by Kow Yokoyama, this 1/20 Ma.K Figure Set A is the perfect accessory for your Antigravity Armored Raider kit! Features four highly detailed figures, accessories and waterslide decals. 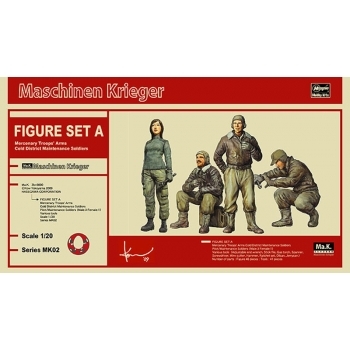 The sci-fi series "Maschinen Krieger ZbV 3000" was created by artist Kow Yokoyama in the early 1980s. It appeared in the popular magazine "Hobby Japan," until the end of the decade. 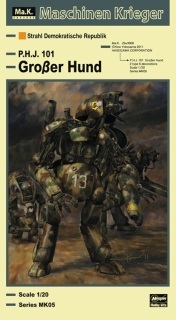 The series' "industrial" design was inspired by armor and aircraft from both World Wars, as well as films like "Blade Runner" and "The Road Warrior." "Maschinen Krieger" continues to have a devoted cult following, returning to "Hobby Japan" magazine in 2009. 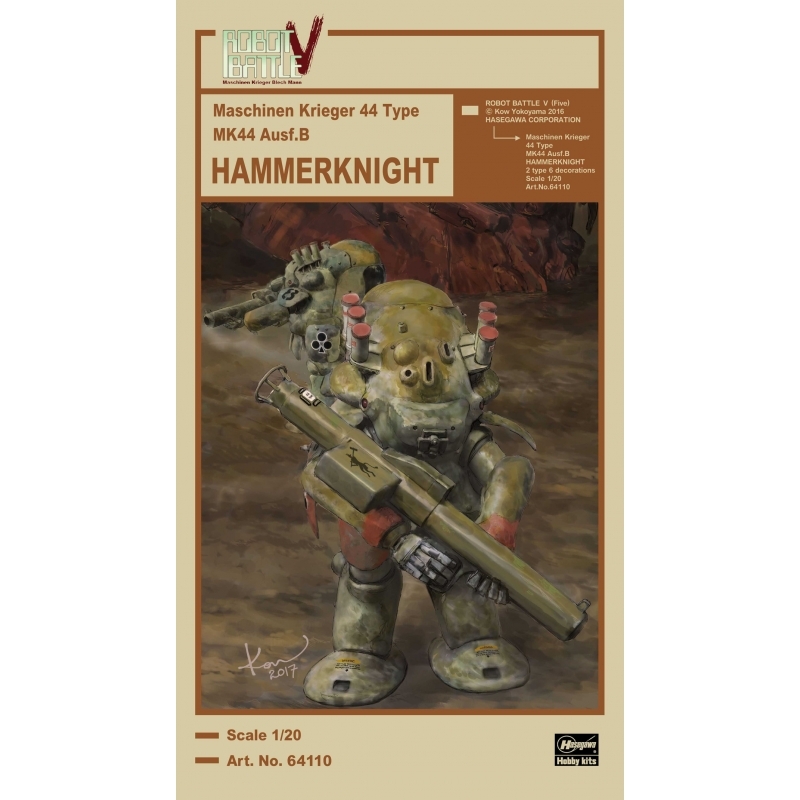 Kit features new tooling and select movable joints. Product Code: HMK05 OUT Of Stock. 1:20th scale. IP. 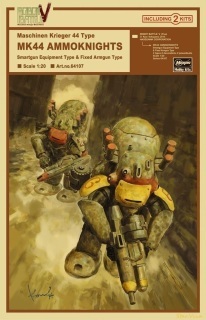 MA.K. ZbV3000 series kit of the Strahl Demokratische Republik P.H.J. 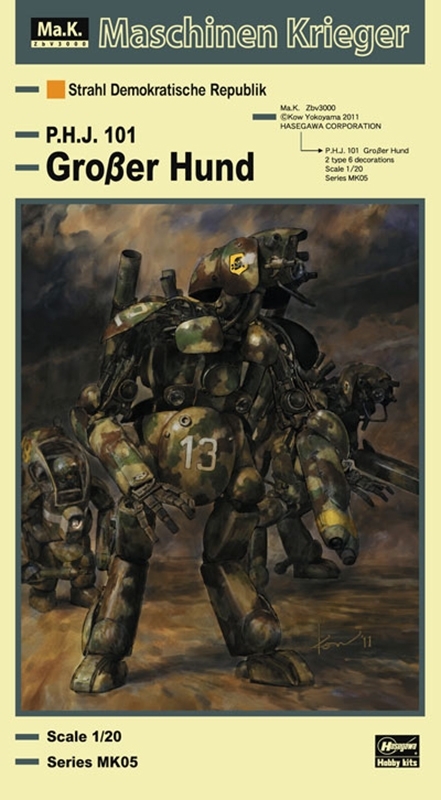 101 Grosser Hund humanoid unmanned interceptor. 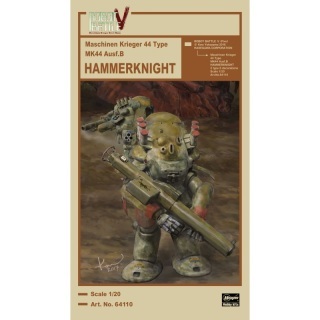 Can be built in one of two variations and six sets of markings. 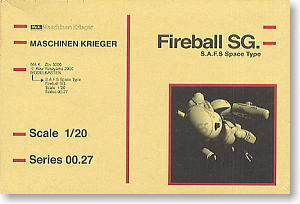 Fireball SG. 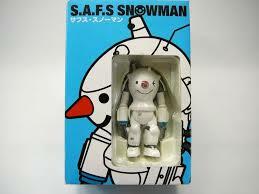 S.A.F.S Space Type. 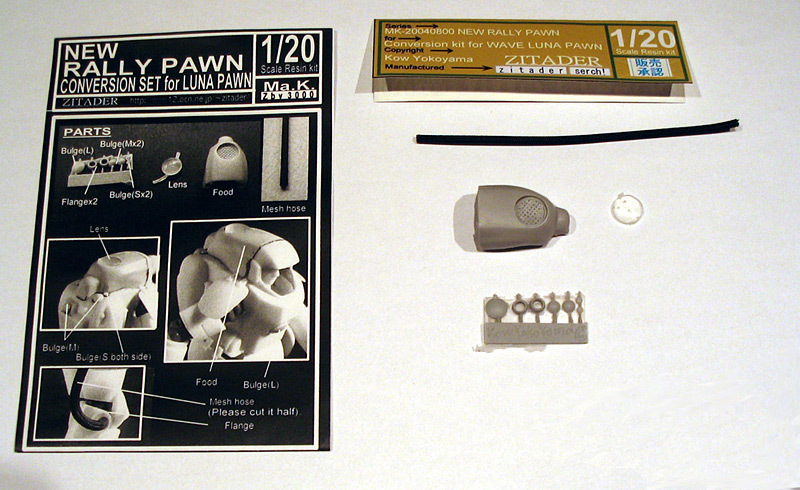 A conversion set intended to convert the WAVE Luna Pawn in Kow's modified Rally Pawn. 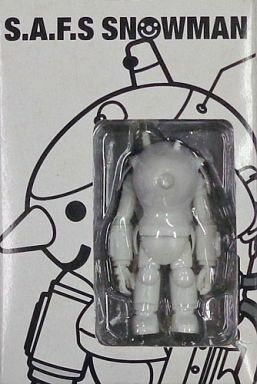 Cast in a grey resin, the smaller sprue with the sensor bulges had some flash but was easily removed. The helmet was nicely done with some minor cleaning up and fitted well to the WAVE kit part. A set of replacement hoses is provided to replace the hard plastic ones in the WAVE kit. Hoses for the arms and feet will need to be added by the modeller. Sculpted by Jason Eaton in the USA. H.U.W.S. 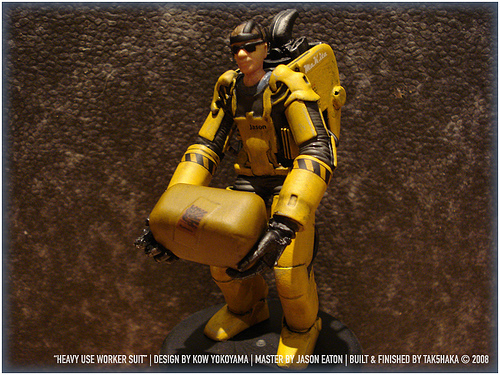 Heavy Use Worker Suit - Industrial and Farm type. 1/35th Scale - Resin. Special Issue. 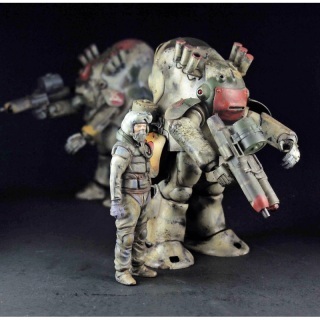 1/20th Scale Resin Conversion Kit to Convert Nitto's Gustav to Melsine Version. 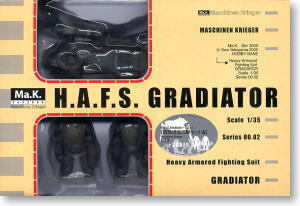 Hobby Base: Heavy Armoured Fighting Suit Gradiator 1/35th Display Model. 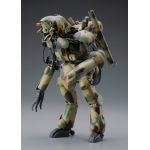 Hobby Base Japan 1/35th Scale. 2.77" Tall. 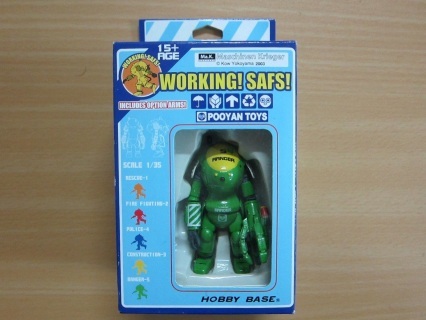 Boxed set of 5 Winter Camouflage SAFS Figures. Produced in 2002 (Very Rare). 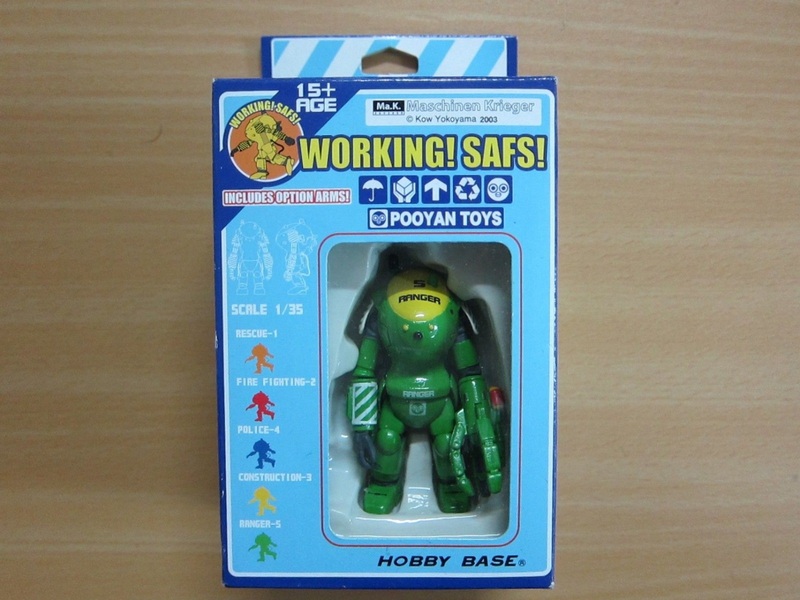 Hobby Base. Scale 1/35th. 2.75" Tall. We have 4 different Colour Variants but only a total of 9 in stock. Hobby Base 1/35th Scale. 2.75" Tall. Slight Dent to bottom of Right side of box. (Contents Mint).